A great tasting energy bars packed with 20g protein and minimal amount of sugar. Fulfil is all about healthy indulgence. These bars taste really good and get you that gorgeous chocolate hit with the benefit of 20g of protein and some great nutrition. High in fibre and have 100% of the RDA for 9 essential vitamins. 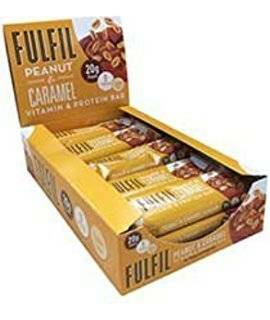 How is Fulfil different to other protein bars? Taste, texture and functionality. Fulfil is low in sugar with less than 3g in every bar. Fulfil is a bar with benefits: 20g of protein, low in sugar and packed with vitamins and fibre. It is a great alternative to empty-calorie snacks if you get hungry in between meals. It's also great after training for some extra protein when you need it.